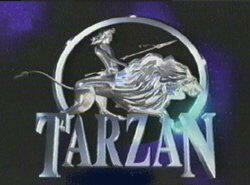 In 1996 to 1997 there was a television series called Tarzan: The Epic Adventures. It ran for one season. Joe Lara starred as Tarzan in the two hour pilot and the following series. It was set between the time when Tarzan has tasted civilization, but before he is married to Jane Porter. Many of the episode plots used places and characters from the original Burroughs' books- including Pellucidar. Cory Everson is cast as a human/mahar hybred Queen of the Mahar, Mara. It looks pretty bad. It has been described as worse than Xena & Hercules (but I kinda liked those). It appears that the series has yet to be released on DVD. As bad as it looks, I am tempted to find it. 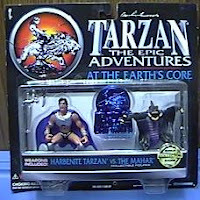 There was a toy line that was loosely related to the show which even expanded to many characters and creatures from Barsoom (although they never appeared in this show). Visit this link for more about these toys. R. A. Salvatore wrote a novelization of the pilot episode in which some plot elements revolved around Pellucidar. This book is one of only three non-Edgar Rice Burroughs Tarzan novels that were authorized to be written. DC Comics is about to reboot their whole line of titles or something. Unrelated to that bit of information, there is a DC Comics Wiki that catalogs all of the publisher's realities. 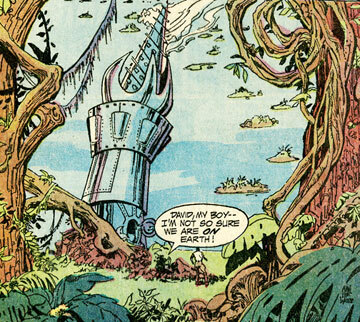 In some form every multiverse setting is represented. This catalog covers everything! 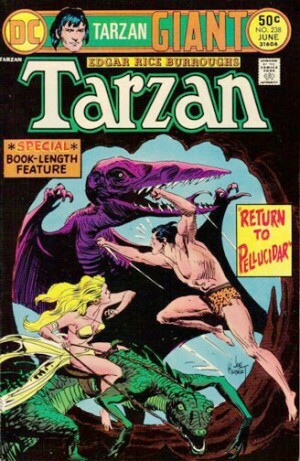 At one time DC Comics owned the rights to produce Edgar Rice Burroughs' titles. They had a nice run of Tarzan which spun off Korak and Tarzan Family. 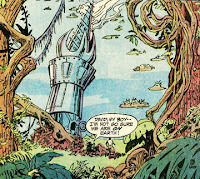 There was a series that covered other Burroughs stories- like John Carter and Carson of Venus as well, called Weird Worlds. All of these belong in the Earth-ERB reality of the DC Multiverse.